Since tonight and tomorrow night are the only two of the entire MLB season with no games or All-Star festivities, it is a perfect day to recap the first “half” of 2015. As you hopefully noticed by now, the first half – before the All-Star Break – of this Major League Baseball season was full of peculiarity, excitement, and disappointment (all of which featured prominently on a June night in LA when the Dodgers walked off on a balk, just the 18th balk-off in the MLB in 100 years) for various players, teams, and fans. From a data perspective, 2015 has already yielded a lot of firsts and changes to the record books. I’d like to begin with some team records and oddities before recapping some of the player-specific feats below. For starters, raise your hand if you thought the Houston Astros (88 days) and Kansas City Royals (80) would both spend more days atop – or tied for the lead in – their respective divisions than the Yankees (60) would in the AL East. Did anyone predict the New York Mets would spend more days (51-43) than the division favorite Washington Nationals in first place in the NL East? Elsewhere, the Pirates (preseason odds of 3 fewer wins than the Cardinals) spent just three days within 1 game of the NL Central lead (0 days in first place compared to 91 for the Cards), but managed to be at most 1 GB in the wildcard race for 61 of the 99 days before the Break. Another first-half surprise: the Toronto Blue Jays have the highest OPS in baseball and have scored 77 more runs than the next closest team – the Yankees. Moreover, the Blue Jays lay claim to a +82 run differential, the highest in the American League and second in baseball to the dominant St. Louis Cardinals (+91). The strange (sad for Torontonians) part about that is that the Jays, who had been 5 games over five hundred as recently as two weeks ago, currently sit 1 game under 0.500. What more can you do to have a good win-loss record than score a lot more runs than opponents? These 2015 Blue Jays are just the 5th team in professional baseball history (all the way back to 1871) to be simultaneously under 0.500 and hold a run differential of at least +80. 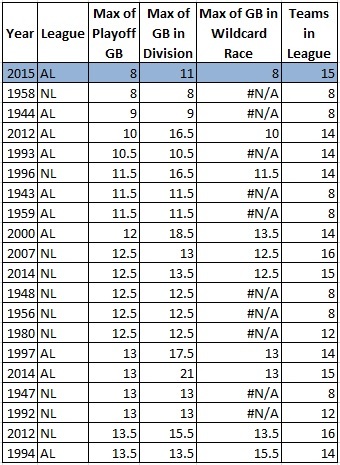 As seen in the list below, of the 14 days in MLB history when a team had a sub-par record as well as at least eighty more runs scored than allowed, the 2015 Canadian club is the only one with that high of a run differential and that low of a winning percentage this early in the season. The only other team on this unfortunate list to appear in July (likewise featuring a high-powered offense and also sitting in 4th place, 1 game below par) is the 1930 St. Louis Cardinals. That team proceeded to go 44-13 the rest of the season, storming all the way to a league pennant, so hope should remain alive and well in Rogers Centre, especially considering the AL East is more competitive at the Break than it has been since 1974. Moreover, based on standard deviation of each teams’ number of games back within the division, the AL East this year (1.63 standard deviation GB on July 8, 2.11 at the All-Star Break) is closer than it has ever been this late in this season with the exception of 1974 (1.30 on July 18, 1.69 at the Break). Another team that is arguably the unluckiest in MLB history: the Oakland Athletics. On July 10th, they held a +41 run differential but were 11 games below 0.500 and remain the American League cellar-dweller with the worst record at the Break. The A’s joined the 1932 Giants, ’67 Orioles, ’80 Cardinals, ’84 Pirates, and 2006 Indians as just the sixth team in MLB history (again dating back to the beginnings of pro ball in 1871) to be more than ten games under par despite having outscored opponents by 40 or more runs. The 2015 Athletics are the first of those six to find themselves in this situation before August. 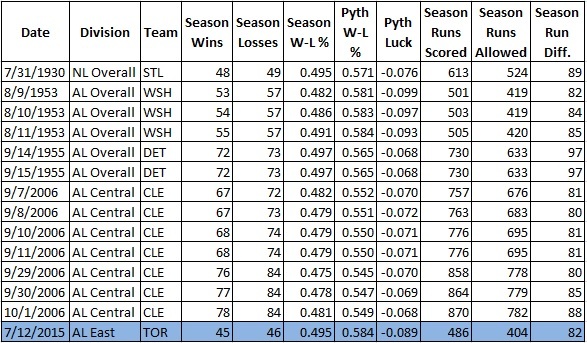 Furthermore, of the 89 combined days that these six teams were 11+ games under 0.500 and 40+ runs over a zero run differential, the A’s had the lowest recorded value (-0.114) for Pythagorean luck (actual win% – Pythagorean win%). Combine those last two ideas with the fact that they’re just 8 games out of the second wildcard spot, and fans in the Coliseum should keep faith in a change of luck as well as in Gray, Kazmir, Vogt, and Billy Beane. Putting that all together: the last place team in the AL is just 8 GB in the wildcard race. If you’re counting at home, that makes this year’s AL wildcard the most closely-packed ever through the first half of the season. The next most competitive wildcard race at the All-Star Break was also under the current 2-wildcard format when every team in the 2012 AL was within 10 games of a playoff spot. The closest before that was under the original one-team wildcard rule when the last place team was just 11.5 GB in the 1996 NL wildcard race, and if I were to convert that to the current format the last place team is still 8.5 GB. Thus, even when adjusting for format, the 2015 AL wildcard race is the most hotly-contested at the All-Star Break to date. In fact, since the first All-Star game in 1933, this year’s American League has the tightest playoff race in MLB history, as seen below. Good news for competition, mediocre teams, and fans of those teams: 5 of the 20 closest playoff races at the Break have occurred since the MLB added a second wildcard (’12 AL and NL, ’14 AL and NL, ’15 AL). On the topic of competitiveness, the NL Central – though it may not be all that tight of a division – is home to two of baseball’s best teams and 10 of the National League’s top 15 starting pitchers according to ERA (all under 3.00). Now that I’ve established part of the broader picture that was MLB’s 2015 first half, let’s delve into some of the individual accomplishments. Some obvious notable achievements from the past few months include remarkable pitching. Chris “The Condor” Sale tied Pedro Martinez’s record for eight straight games with double-digit strikeouts, Zack Greinke posted a mind-boggling 1.38 ERA with 35.2 scoreless IP (12.1 short of the mark set by the entire Nationals starting rotation) going into the Break by hurling like we haven’t seen since the mound was lowered and the strike zone shrunk, four Indians starters each had over 100 strikeouts before the All-Star Break, and rookie Giant Chris Heston no-hit the Mets on June 9 while fanning 11 and plunking a no-no record 3 batters in the process. What else happened in the first half? That’s right, Max Scherzer happened. Like Heston, Scherzer (1) tossed a no-hitter in June (2) with double-digit strikeouts (3) and the hit-by-pitch column was all that stood in the way of perfection. That performance of course came on the heels of just as spectacular a complete game – shutout, 16 K’s, 1 bloop single, 1 walk. Mad Max became the first pitcher in MLB history to throw consecutive shutouts while allowing 1 or fewer hits and either (1) striking out 10 or more batters or (2) allowing 2 or fewer batters to reach base. Additionally, Scherzer’s Game Scores of 100 and 97 are the highest back-to-back scores posted in 9-inning games. Let’s not forget about the equally impressive batting feats of the pre-Break 2015 season. Five players had 3-homer games, three perennial All-Stars (Adrian Gonzalez, Joey Votto, and Bryce Harper), a 2015 first time All-Star (J.D. Martinez), and the man who had hit three home runs apiece in each of the past two seasons (Kirk Nieuwenhuis). On the topic of home runs, Prince Fielder hit his 300th career blast, joining his father Cecil as the 2nd father-son duo to both reach that milestone – Bobby and Barry Bonds being the other. Several other milestone home runs were hit during the first half of this season. Albert Pujols hit 26 first-half homers, his most before the Break since 2009 when he had 32 longballs and eventually took home MVP honors for the second straight year. More to the point, those blasts got “The Machine” to 546 career home runs, past Jimmie Foxx and Mickey Mantle into 16th on the all-time list. Pujols sits just 10 more big flies from passing Mike Schmidt and Manny Ramirez for 14th. Meanwhile, Alex Rodriguez’s 660th career home run (tying Willie Mays for fourth all-time) and his 661st dinger (passing Mays for sole possession of 4th) both gave the Yankees 3-2 leads, while his 667th bomb gave him his 3,000th career hit. Whether you like him or not, A-Rod is poised to pass fellow Yankee George Herman “Babe” Ruth, Jr. for third (714 homers) on the all-time home runs list before his contract expires in 2017. Speaking of great hitting performances, I would be remiss not to mention one of the more revered batting exploits: the cycle. All-Star utility man Brock Holt hit for the only cycle of 2015 so far – the first for the Red Sox in two decades – and then he and teammate Mookie #YaBettsBelieve Betts both came close just 5 days later. Similarly noteworthy is that Brock Holt is not only an All-Star baseball player, but also a Swiss Army knife; he did what had only seen 7 times in the past century of professional ball: play first base, second base, and left field all in one game. It would be too typical of me to end this recap with the one good thing the Red Sox had going for them. So instead, I leave you with this: Bryce Harper (age 22, 3 years since debut, 4th season) put up insanely good numbers in the first half, very close to those that Willie Mays (age 23, 3 years since debut, 3rd season) posted in the first half of 1954, when he won his first of two NL MVP Awards and made his first of 20 All-Star Game appearances. Both outfielders won the National League Rookie of the Year honors, so look out for Bryce to continue his campaign as a leading candidate for the NL’s Most Valuable Player.